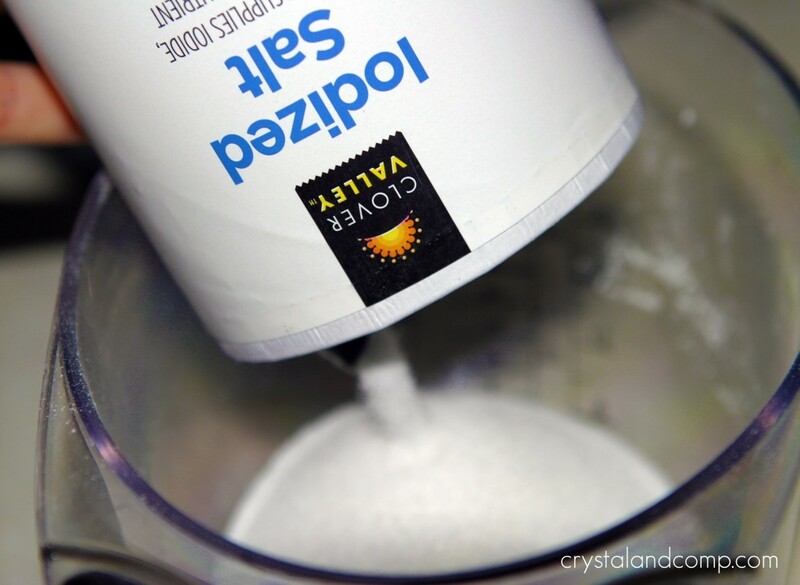 Do you love making homemade play dough recipes? I have many different tutorials here in my site. The air is becoming crisp outside and Autumn is in the air! Let’s make some Pumpkin Pie Play Dough! It is super easy! And this version is dye free! 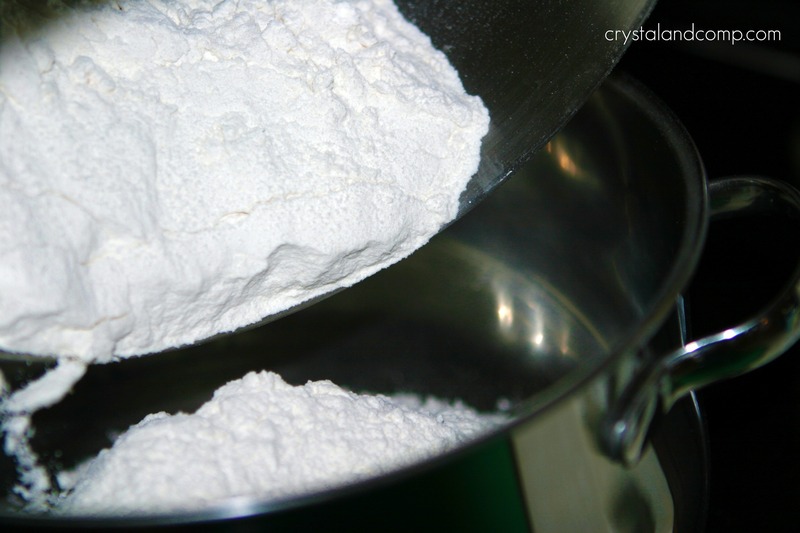 In a large pot (saucepan) (like what you would use to boil a big batch of spaghetti noodles), dump in your flour. 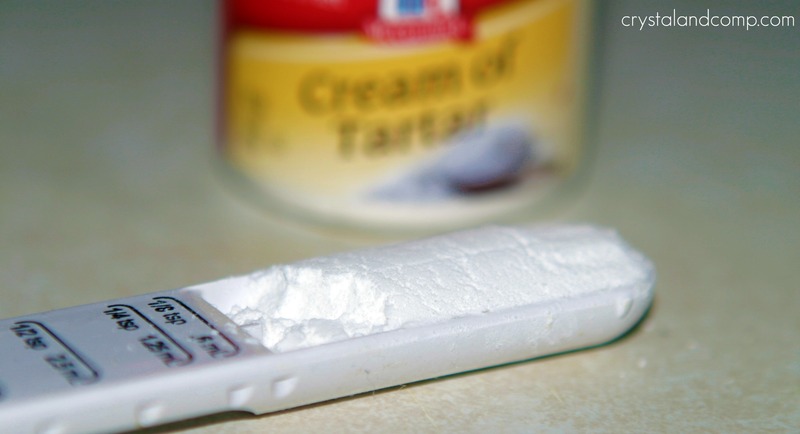 Measure out the Cream of Tartar and add it to the pot. 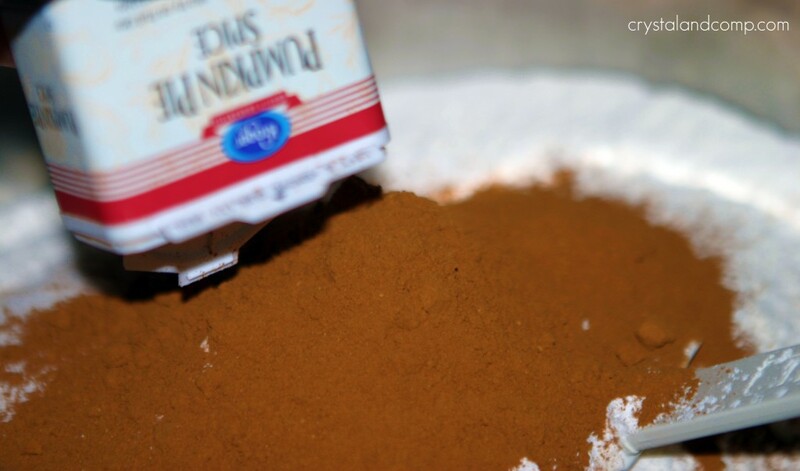 Add in your Pumpkin Pie Spice and stir. Like I said, I totally forgot about the food coloring, but this is where you can add it too. Add the coloring until you get the desired tone of pumpkin you want. Warm the ingredients up over a medium heat. Mix it until you get all the lumps out. After about 5 minutes of stirring it will start to look like brown sugar. This means you are good to go. 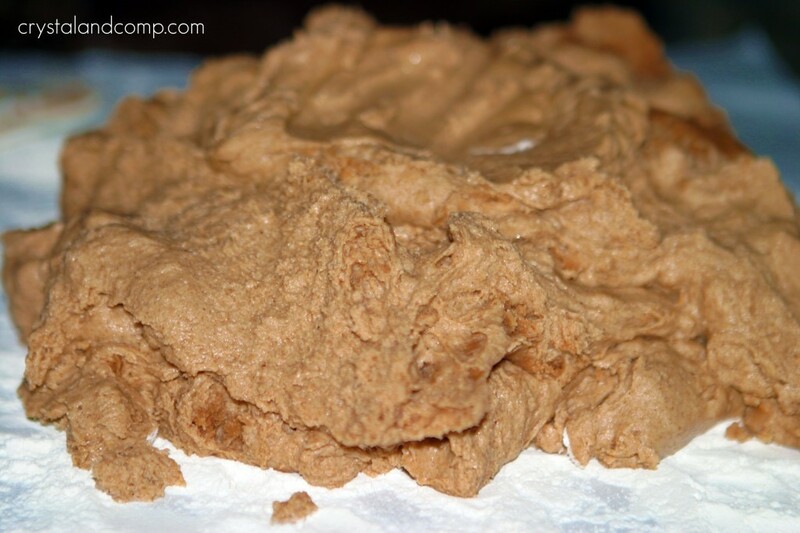 Dump the dough out onto a floured space. Start to knead the dough until it is no longer sticky. Play and enjoy, but do not eat it. You can smell it. Oh, it smells amazing! We used cookie cutters and toys to make things and create. In a large pot (saucepan) dump in your flour. Like I said, I totally forgot about the food coloring, but this is where you can add it too. Add the coloring until you get the desired tone of pumpkin you want. Warm the ingredients up over a medium heat. Stir, stir, stir. Mix it until you get all the lumps out. 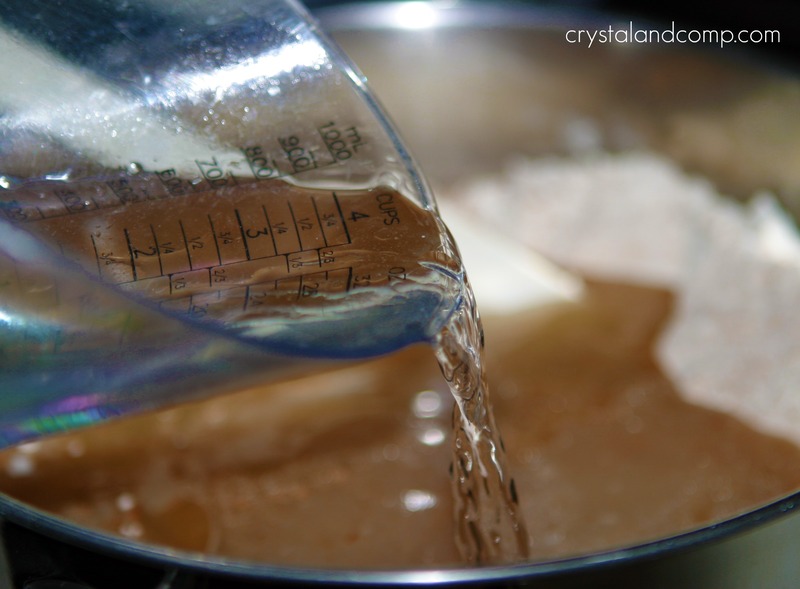 After about 5 minutes of stirring it will start to look like brown sugar. This means you are good to go. 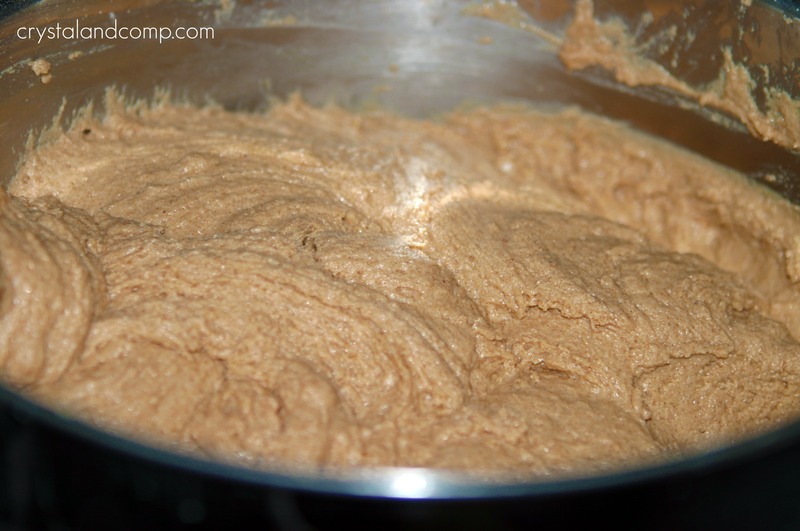 Knead the dough until it is no longer sticky and takes on a play dough consistency. Play and enjoy, but do not eat it. You can smell it. Oh, it smells amazing! We used cookie cutters and toys to make things and create. Enjoy! Love, love and love this. I’ve never heard of it before! Definitely putting this on the list for the little girls to do this week. How awesome- let me know how it goes. Crystal i SOOOOOO want to make this for my class! You should Pam. It is so much fun and smells so good! Kim, Skylar would have so much fun with it. Great homeschool project. Awe Becki, that is so sweet. I will make sure they wash their hands. Great point! How fun! I would have never thought of using a scent in homemade playdough. I bet it smells amazing. I might have to make some for my youngest. Jen, I am storing it in a Ziplock bag to keep it from drying out. I can smell the pumpkin through the bag. Smells like fall. That sounds like something my kiddos would love. And anything that smells like pumpkin is a hit with me! Love this! 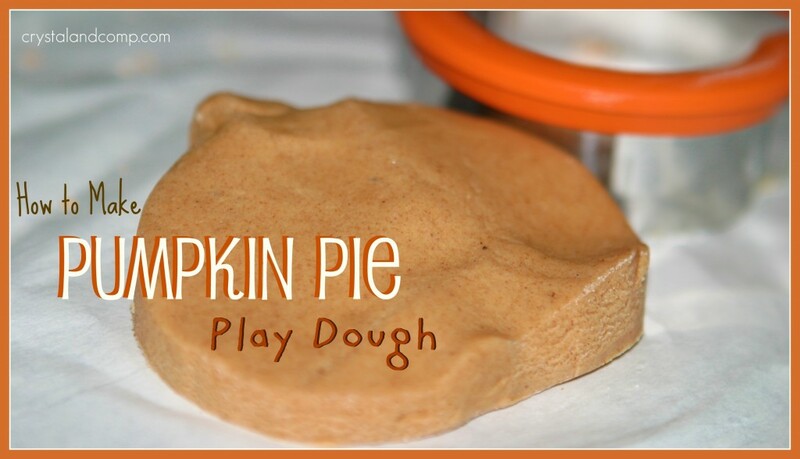 Play dough is always a hit at our house and I would love the smell of pumpkin pie while the kids are playing with it! Oh girl! 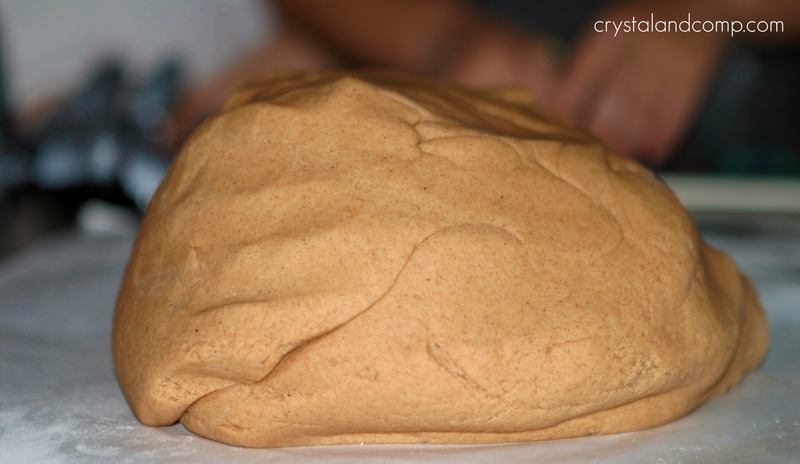 I have made homemade playdough a bagillion times but never with the smell of pumpkin pie! I’m thinking this would be a great treat for us this weekend. Although I might have to enjoy a little pumpkin latte while Charlie plays…Thanks for sharing the recipe! A pumpkin latte sounds perfect. I love surrounding myself with wonderful smells. It brings me lots of joy and the idea of having the play dough smell like pumpkins is just wonderful. My boys are older now.. 14, 12 and 11 so they don’t like playing much with playdough.. however I do have my nephews and my niece that I can make this recipe with and play with them. Thanks for the step by step to make it easier for us to use. Awe, thanks for the tweet and thanks for reading. Honestly, the play dough recipes that require cooking have always turned me away. But, once I made this one it was so easy I really wanted everyone to see how simple it is. You cook it for a very short period of time just to combine everything and get the lumps out. Pass the recipe on to your nieces and nephews. I bet they would love this fun fall project. Will do and I’m excited to make this here at home since I believe that the smells will be very therapeutic for me. Thanks for the recipe! So great! I’m hosting a Fabulous Fall party over at Not So Simple Housewife and I’d love for you to link this up! We are celebrating Fall and giving me and everybody else some great inspiration. We are looking for crafts, decor, food, and more! I’d love for you to add this and any other fall posts you may have! Bet that smelled amazing and your creations turned out so cute! Thank you Lori! My boys were so creative with that play dough. I loved the spiderman body impressions as ‘skeletons’. They crack me up! I could bury my nose in a jar of pumpkin pie spice all day 🙂 I think I like the natural color without the food coloring. So glad I stumbled upon this recipe. Thanks! OMG! This is delightful! I would have trouble not wanting to eat it lol. I am looking for guest speakers on my blog to post tutorials for the season. If you would be interested please please contact me. I would love to have you! Please come link this to my VIP party this weekend http://designergarden.blogspot.com/2011/10/vip-party-34.html and have a Happy Halloween! looks great, I think even I might be tempted to eat it! thanks so much for sharing on Craft Schooling Sunday! we just made pumpkin spice play dough today – how funny that I came across this now!!! Thank you for linking up to Homeschooling on the Cheap! Last week. Your post was the #1 most clicked link~ Thank you for sharing and stop into see your feature and link up more ideas! OH MY!!! I LOVE pumpkin anything. I spotted this atthe bowdabra link party and just had to click. Can’t wait to try this with my girls. Thanks for sharing!!! This is awesome. I’ve made kool aid play dough but this is a new twist! Thanks! That looks like fun and I’m sure it smells good, too, my kids would probably want to eat it! Congrats, Crystal & Co! Your wonderful idea was our #1 most clicked link last week. We are featuring you on our blog, Facebook/Twitter and Pinterest Boards. You are already a contributor on our Feature Friday Board from your past submissions. Feel free to link up your crafty ideas any time on that board and we will repin them for you. Having kids make playdough would be such a great activity to do with friends on an after school play date. They could take turns choosing the scents and colors. Thanks for linking up and sharing at After School! Thanks for sharing on our After School LInk up. I know we’ll be making a batch of this for sure to incorperate sensory play after school. Can’t wait to see how it turns out. Hope you’ll join us all year long as we share the activities we do after school with our children. What a fun idea and I bet it smells amazing! Thanks so much for sharing at Mom On Timeout! We love this and are featuring you in our top 10 Pumpkin crafts! I made two batches of this today to send to my son’s class Halloween party! In the first batch, it took FOREVER to make it stop being tacky to the touch, so in the second batch, I started with an extra cup of flour. 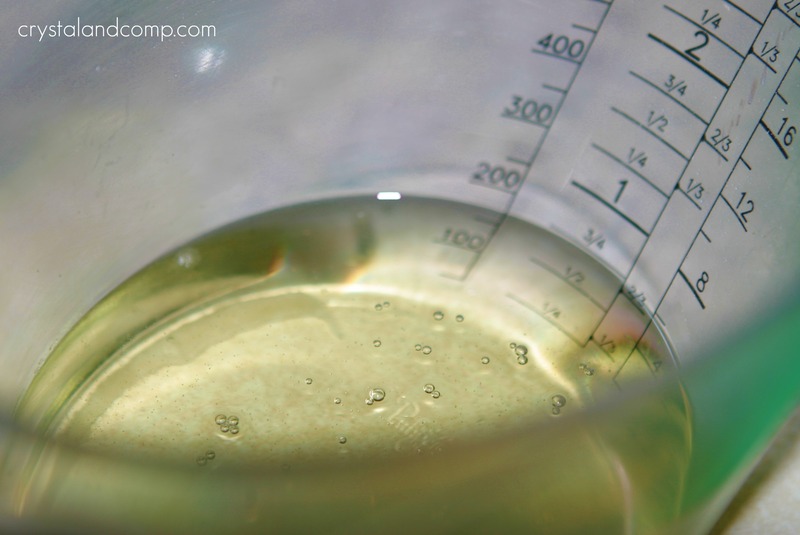 I added 60 drops of food coloring in each batch, and got a pale orange color. Each batch made ~8 cups of play dough! Amanda- how exciting. What a great treat to share with a classroom of kids! What a great idea to add the pumpkin scent! My son is always asking to do play dough, so this is great! Thanks for sharing this fantastic recipe at Titus 2 Tuesday! Pinned it! I absolutely loathe the way playdough smells so this is a great idea! Will have to wait until my wee one is older, though. He still tries to eat the gross stuff. 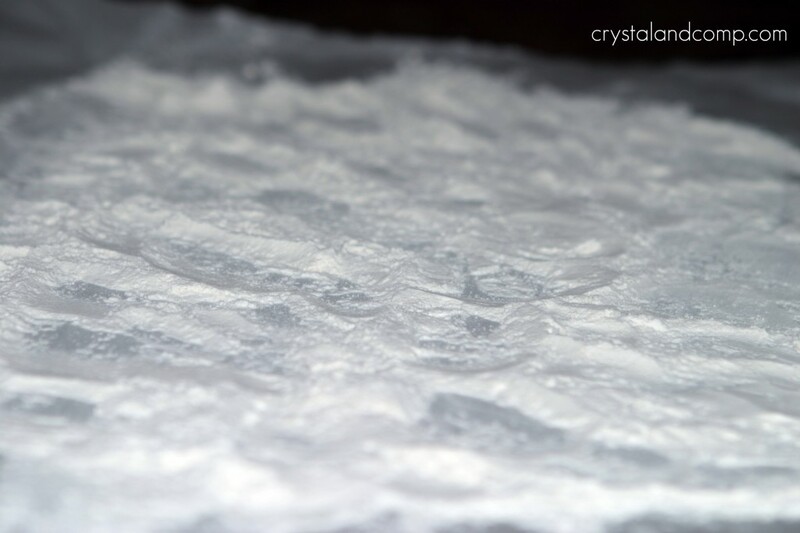 I can almost smell it… love your beautiful picture tutorial! Thanks for sharing with the After School bunch. Congratulations…this post was featured on Create It Thursday #25! Thanks for sharing such a wonderful idea last week! This is so cute. My students are studying pumpkins right now and it would be great to make some of this for them, since they love play doh too. Pinning! I have some pumpkin spice to use up. I think this will be in our plans if I have enough salt. Great idea. Visiting from TGIF linky. Love this recipe. 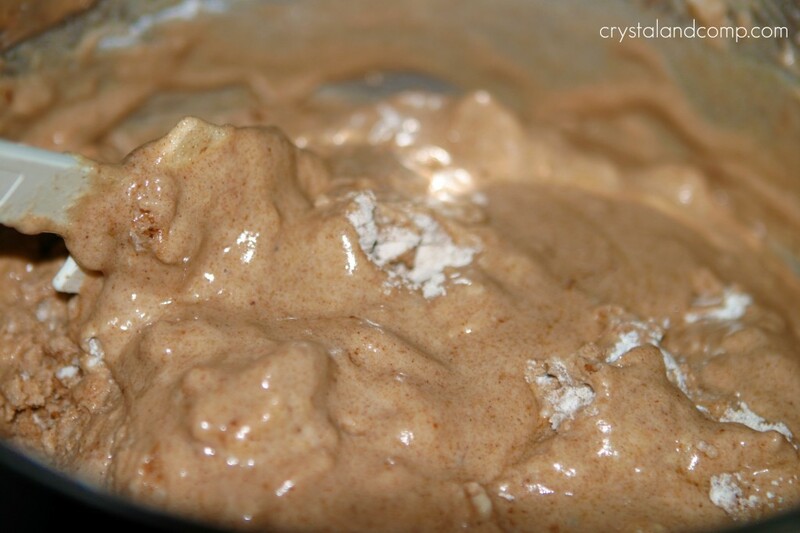 I did have a chocolate play dough recipe…now this one whooo hoo! Chocolate play dough? Oh, that sounds divine! I bet that would work just fine. 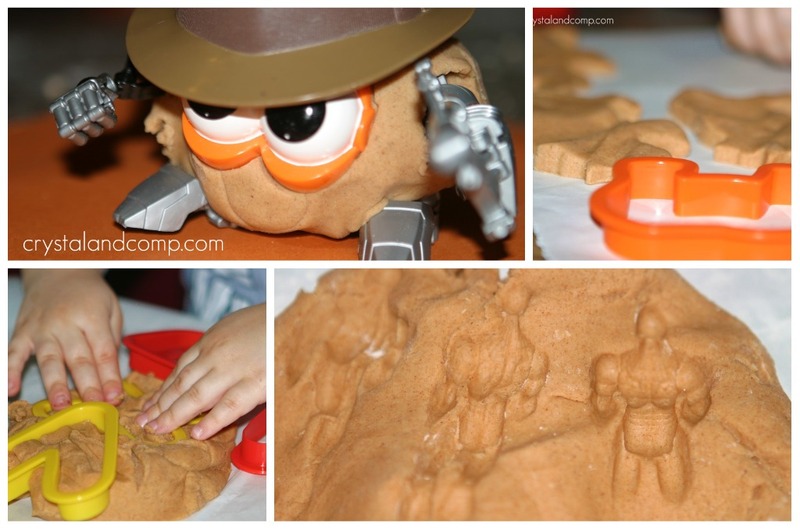 Thx for linking this yummy looking fall play dough up with us at the thoughtful spot! This looks like is smells heavenly. What a great way to spend a sad game. Thanks for the post and idea!